Below is a good example of the varied origins of place names in San Diego County. It’s part of a column from the San Diego Union of August 25, 1886. Nestor A. Young was elected to the state assembly from San Diego County from 1887 to 1893. He also served as a member of San Diego’s first harbor commission. By the late 1890s he’d moved on to the Los Angeles area where, among other things, he sold real estate. But his time living in the area near San Diego’s border with Mexico led to the creation of a community that took his first name. Nestor was an independent ranching town until it was annexed by the city of San Diego in 1957. 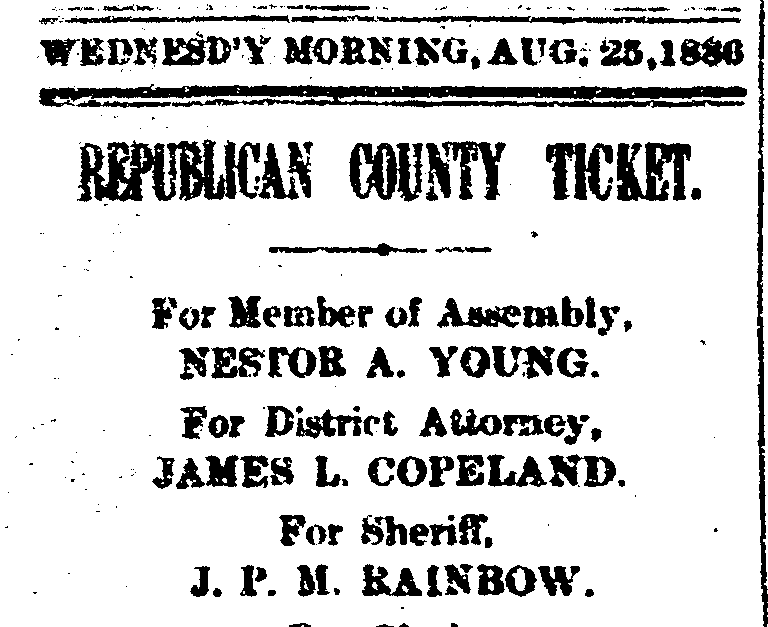 James Peebles Marshall Rainbow didn’t get elected sheriff in that 1887 campaign, but he did serve two terms on the county board of supervisors from 1882 to 1884 and from 1891 to 1895. He also was a fruit grower and leader of the little community that grew around his ranch in the valley near Fallbrook which still bears his name. Sources for this post included historic San Diego and Los Angeles newspapers, the 1890 book An Illustrated History of San Diego County, by the Lewis Publishing Company, and the 2005 book, San Diego County Place Names A to Z, by Leland Fetzer. Once Upon A Town represents my further research into San Diego County’s “lost towns,” towns and villages that once thrived, but then disappeared. 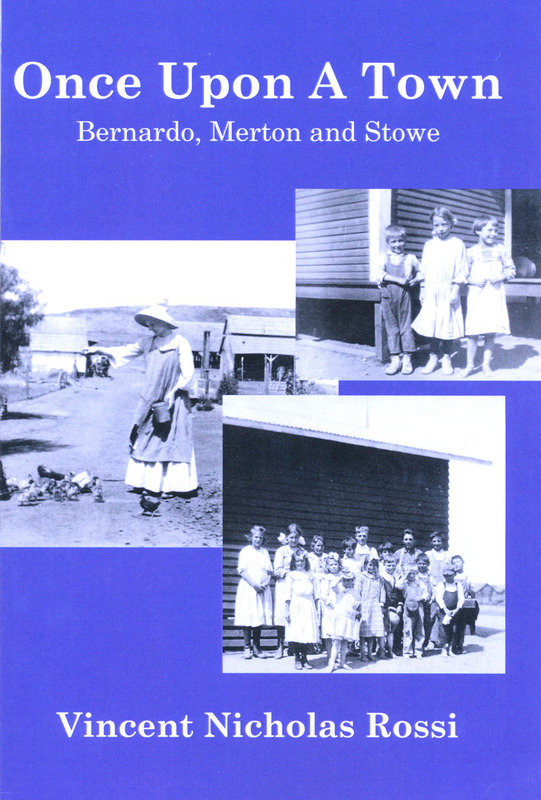 Building on my previous book, The Lost Town of Bernardo, Once Upon A Town adds the stories of two neighboring Poway Valley towns, Merton and Stowe. Through photos and anecdotes gleaned from my research in county museums and archives, I offer a picture of people and places from another time in county history. I’m offering it right now for $12.00, tax included, plus $3.00 for shipping. Just send a check or money order for $15.00, made out to StorySeekers. Mail it to StorySeekers, PO Box 27343, San Diego, CA 92198-1343. I’ll get the book right out to you. I’ll also be setting up this site for PayPal orders soon. If any of you happen to be attending the annual meeting of the Heritage Ranch this Sunday at the Olivenhain Town Hall, I’ll be speaking on Bernardo and offering Once Upon A Town for sale afterward, along with a previous book, Valleys of Dreams. You can get regular updates of San Diego History Seeker automatically in your email by clicking on the “Follow” button in the lower right corner of the blog page. You’ll then get an email asking you to confirm. Once you confirm you’ll be an active follower.